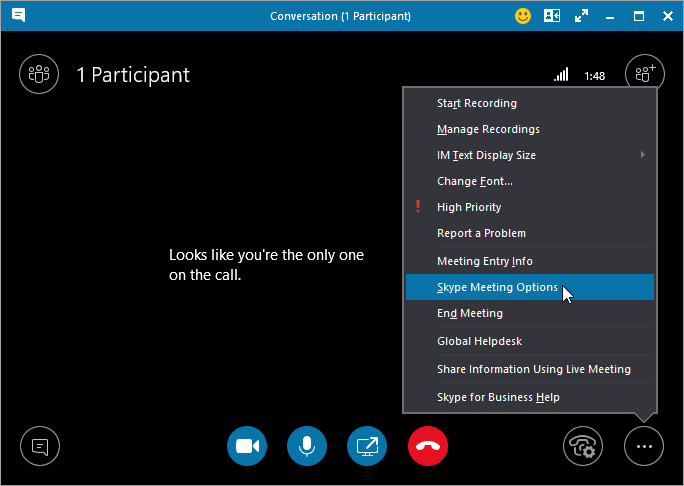 When a user joins a Skype for Business Online meeting over the phone, he or she is prompted to record their name so it can be announced to participants as part of entry and exit announcements. If the caller doesn’t record their name, Skype for Business uses text-to-speech to announce the phone number of the caller, where available. The organizer of a Skype for Business meeting specifies whether participants should be announced when they join or leave the meeting. The tenant admin can configure the Microsoft dial-in conferencing settings to enable or disable name recording. The tenant admin can also turn entry and exit announcements off for the entire service. NOTE: The entry and exit announcements for callers are only played for participants who have joined over the phone and not for participants who have joined using Skype for Business client on desktop or mobile phone. Sign in to your Skype for Business meeting. 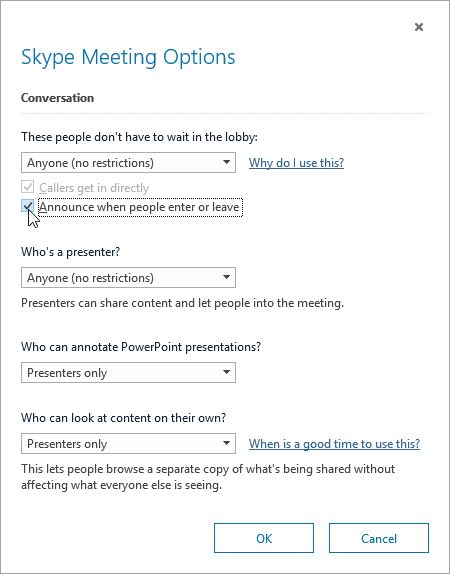 Click More options > Skype Meeting Options. Check the box next to Announce when people enter or leave. If you're signing in to the meeting as an employee or authenticated user (a user with a work or school account), your name as listed in the work or school directory will be announced when you enter or leave the meeting. If you're attending as a guest, you'll be asked to provide a name when you sign in, and that name will be announced when you enter or leave the meeting. Why is the screen blurry when using MirrorOp?